It's enough to make you swear of planes altogether. Ten people were injured Monday when the front wheel of Southwest Flight 345 collapsed as it hit LaGuardia's runway — the second major passenger jet to have an accident in as many months. According to the airport's general manager, the plane's front wheel crumbled when it landed on runway. The aircraft then skidded on its nose before finally stopping in a grassy area half-way along the tarmac, after which the 150 passengers evacuated on emergency slides. Only 10 people suffered minor injuries and just six needed to be taken to a hospital. 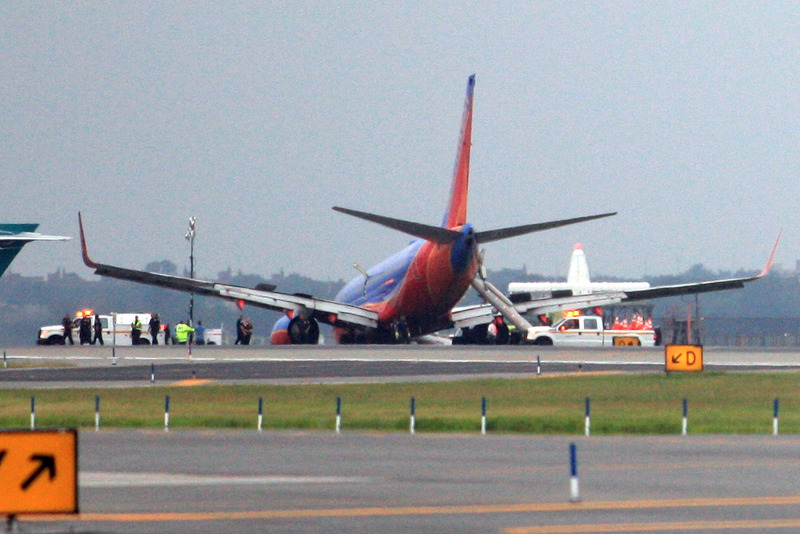 The accident occurred at around 5:40 PM at New York's LaGuardia airport, as the plane flew in from Nashville. Airport officials are maintaining that there were no warning signs of problems before the landing, but some of the passengers are saying otherwise. One claims that the flight was delayed leaving Nashville, adding that she heard an announcer saying the reason was "something was wrong with a tire." LaGuardia airport had to close for a few hours after the accident, but is now up-and-running again.